I’ve seen this statement all over lately, and at this point, I’m taking it as a sign and adopting it as my 2012 motto! 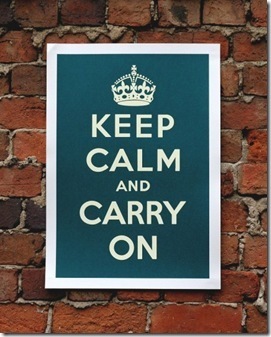 It was either this one, or the “Keep calm and eat cupcakes” poster. And that just wouldn’t jive with my weight watchers plan. 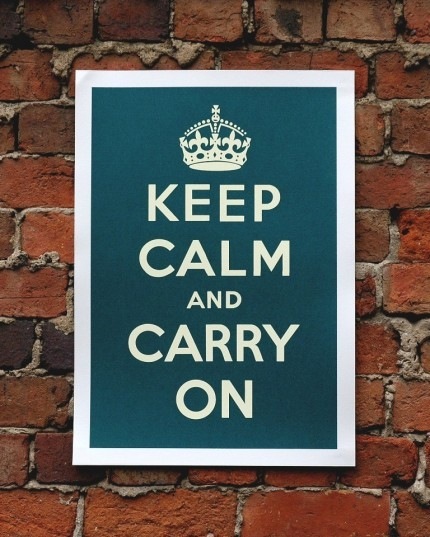 Did you know the poster was first created back in 1939 by the British government at the beginning of WWII to raise the morale of the British public in the event of an invasion? In light of the chaos a homeschooling family can face, I thought it was a perfect motto for the year! “for the wrath of man [mom] does not produce the righteousness of God”. Last week I was so encouraged by Ruth at The Better Mom and her challenge to create a family mission for 2012! I really desire to live my life purposefully. To be deliberate in my parenting, teaching, and care for our home. It’s so easy to get caught up in the daily grind, and to view our homemaking as a chore instead of a blessing. I really don’t want my children to remember their mama as being tired, crabby and dissatisfied with all the blessings that God has given her. So this year, I’m resolving to be deliberate in my actions! To live life in a purposeful manner, to be present and thankful in each day! That means prayerfully considering commitments, and even having the courage to say no to some things. I’m not sure if I’ve told you or not, but I’m a “yes” person. It kills me to say no to people, and with the increase in my blog traffic, it’s been something that I’ve had to start doing. I’d love to make everything for everyone, but it’s just not possible. Not without sacrificing something else. Namely my time with my family. So this year I’m focusing on priorities, I’m keeping God first, and family close behind. Being blessed ourselves, we will pray for those who do not have a Bible to read, food to eat, clothes to wear, or toys to play with. We will encourage, respect, and honor one another by speaking in a gentle and kind manner. We will practice gratitude by taking care of our belongings and being thankful in all circumstances. We will strive to be peacemakers in all situations and be quick to apologize and forgive one another. And finally, we commit to replacing the toilet paper roll if found empty. 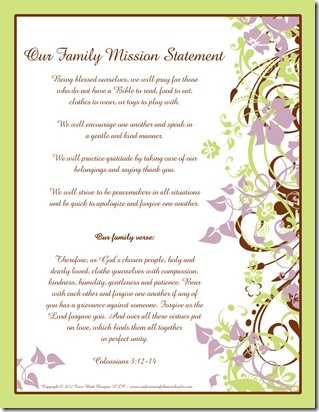 I created this printable of our family mission statement. In the event you’d like to share this with your family, I’ve made it available as a free download for you! Ut oh…for some reason I can’t get the link to come up so I can download it and print it up. The link is saying there is an error. Sorry the link is not working. When I try to open the download it tells me the file is corrupt. Hi Erica! I was a yes person too until I really can’t reject evil. but I have my progress now. I am brave to say “no” to the evil. How funny! I just began drafting a post last night on our finally completed purpose statement when I realized that in doing so I was following part of it (time for myself) but neglecting another aprt of it (prioritizing the other memebrs of my family – b/c an overtired mom the following day would help no one.) So, I will get ours up on our blog and on our wall at some point. More important to me is living by it. Also, I love the idea of a family verse, but am not sure my husband is at that point yet. I may pick one out for myself for the year though. Meditating and living by a piece of His Word would certainly be a great habit to develop for doing so better with ALL of His Word. May you and yours continue to be blessed and may He strengthen and guide you in living your mission well, especially in prioritizing Him, then family then everything else. It is hard for us “yes” people and “do-ers” to pause to choose that sometimes. This is so great! Your blog is such a blessing to me and so many others. I love the mission statement, and especially the Scripture – such great verses! I do wish you had left the toilet paper part on the printable version – it’s a problem here at our house too! lol I may do a training session soon to teach the whole family how to replace the roll, hubby included. Yes, thanks for sharing this Erica! I agree with Stephanie, the toilet paper part I believe is an issue in most households, certainly mine! hahaha! PS: I can’t download the file. It seems that the link is broken. Thank you so much. You so eloquently put into words what has been in my heart. You and Jolanthe have really ministered to me today and really spoken to where I am at. I have been struggling with depression for about 3 1/2 months and much of that is from feeling inadequate at what I’m doing, But with 2012, I am pulling myself up by my proverbial boot straps and accepting myself as God created me and living in what he ordained for me. Since I don’t want to waste precious time searching and “re-inventing another wheel”. I am gleaning from your wisdom and using your mission statement.